Trafalgar Square opened to the public in 1844, and was laid out in remembrance of Admiral Horatio Nelson's great victory over the French fleet at the Battle of Trafalgar in 1805. Unfortunately, the rejoicing that followed the news of his momentous victory was somewhat muted, since Nelson himself was killed at the battle, shot in the back by a French sniper as the fact that he had been victorious became clear. From that point on it was decreed that England would expect every citizen to have the right of free speech; and where better to demonstrate that right than in the square that remembered the Naval victory that had gone so far to ensuring that right? Thus, Trafalgar Square became the favoured location to which all freeborn Englishmen (and women) would gravitate to should they wish to protest against the status quo (and I'm not talking about Rick Parfitt and Francis Rossi), and, in consequence, the lower orders began congregating here in ever increasing numbers throughout the second half of the 19th century. These were was not quite the freeborn English folk that the powers-that-were had had in mind when - in, what in retrospect must have seemed like a moment of genuine madness - they had declared the right of the people to protest in Trafalgar Square; and as the Victorian era entered its final throes, the square became the scene of numerous clashes between the haves and have nots. In consequence of such events as The Bloody Sunday Riots of November 1887, it was considered necessary for the upholders of the rule of law - i.e. The Metropolitan Police - to be able to keep a watchful eye on the revolting peasants who were prone to gather in Trafalgar Square to make their displeasure known against what they saw as the blatant inequalities of the age. In the closing years of the 19th century all manner of methods were dreamt up in order to enable the Police to maintain order in Trafalgar Square. A temporary police box was erected in Trafalgar Square just before the commencement of World War One. However, during the General Strike of 1926, the decision was taken to make this temporary observation box a permanent fixture, so that a close eye could be kept on the activities of the striking workers who were muttering about exercising their democratic right to air their grievances in Trafalgar Square. The suggestion met with so many howls of public indignation that it was officially shelved - although, unofficially, the authorities began to explore the type of observation box that could be erected in the square without causing too much trouble. 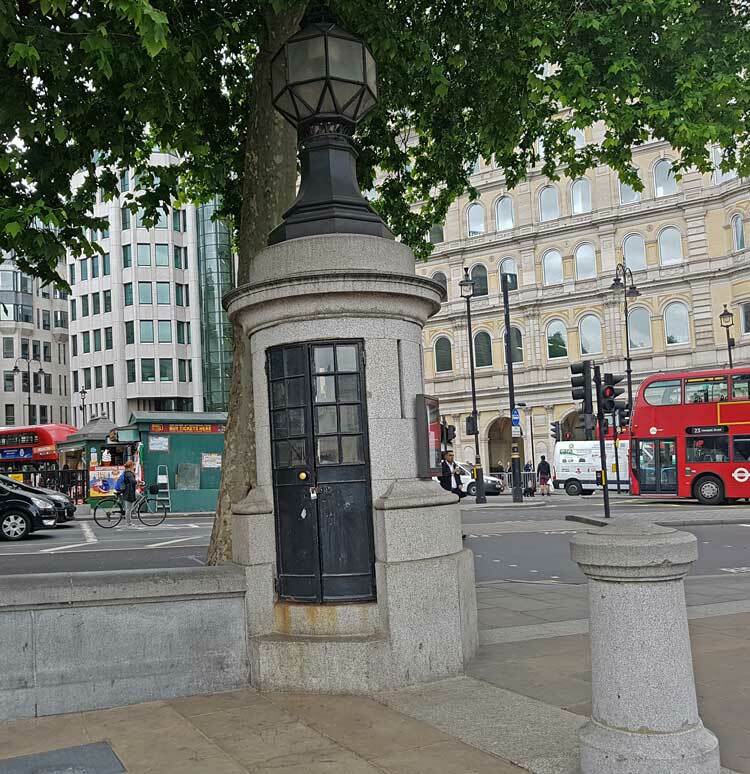 Then, in 1927, Sir Lionel Edwards, head of the Office of Works, came up with the bright idea of hollowing out the base of one of the square's lamppost plinths in order that it might be used as the desired means by which a police officer could keep a watchful eye on the toing's and froing's in and around Trafalgar Square. 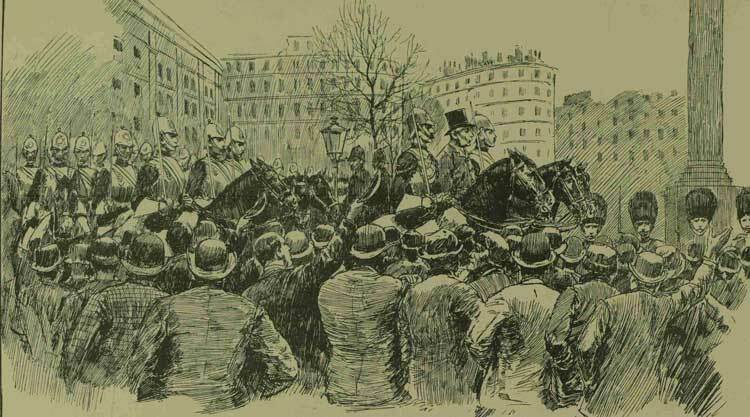 The plinth that was chosen was the one in the Square's south-east corner; and thus the workmen set to work on creating what would become London's smallest police station. To enable the officer inside the box to have a clear view, arrow slits were carved into the hollowed out plinth; and, to enable him to summon back-up when the need arose, the box was connected by phone to nearby Canon Row Police Station. Sources differ as to when the box was actually pressed into service, but it was certainly being used by the 1930's and - and I must say I am guessing here - those police officers who drew the short straw and were assigned "box duty" in Trafalgar Square, must have approached the "station" with feelings of extreme trepidation. One of the traditions concerning the box is that the ornamental light atop of it came from Nelson's flagship HMS Victory. It is a wonderful tradition, but, sadly, it is just that, a tradition that simply isn't true. However, the light served a useful purpose - or at least it might have seemed like a useful purpose when mooted in the office of whoever dreamt it up. Should the box's occupant need to use the phone to summon assistance, the light would begin to flash the instant he lifted the receiver. This was intended to alert any nearby police officers that the mob were becoming unruly, and they could therefore move in and quell any disturbances before they got out of hand. A brilliant idea - on paper, at least. However - and, cards on the table here, I'm no expert on police procedure in the face of revolting rabbles - I can't help thinking that, if I were a lone police constable, sitting in a stone tube, watching a surging mass of protesting humanity, that is on the verge of a full scale riot, the last thing I'd want is a light flashing atop the box I'm sitting in alerting the mob that I'm phoning out for reinforcements. But, then again, perhaps protestors held more respect for the forces of Law and Order back then? So, should the question of where to find London's smallest police station ever cross your mind, you now know where to look. Simply make your way to the south-east corner of Trafalgar Square. and there its sits in all its glory. Unfortunately, if you want to get a photo of a British Bobby sitting in his purpose-hollowed-out tube, you will have a long wait. For, like an elderly Admiral, whose days of glory are long behind him, the box has been decommissioned and it is now used as a broom cupboard by the cleaners who work for Westminster Council.